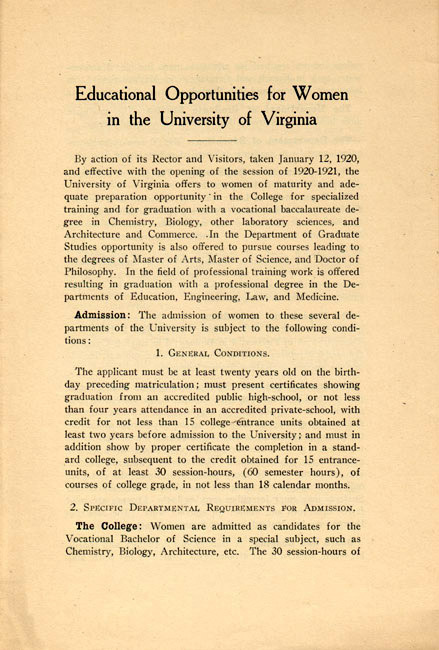 "Educational Opportunities for Women in the University of Virginia." . Few women took advantage of the special tutoring allowed by the faculty in the 1890s and prejudice against their matriculation remained strong. 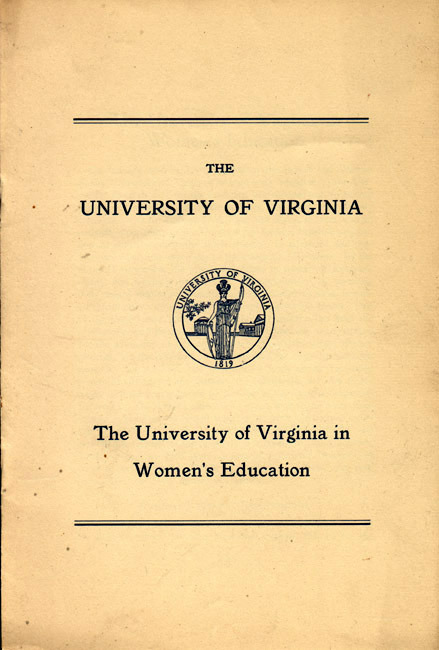 For thirty years, many prominent Virginia women called for equal education for women--either through the establishment of a coordinate college or through equal admission to the University. Finally on January 12, 1920, the Rector and Visitors voted to admit women of "maturity, ability and adequate preparation" as candidates for graduate, professional and vocational degrees. "The University of Virginia in Women's Education." . The women admitted quickly formed their own traditions. Informal weekly teas were probably the most popular and well known. Less well known was the refusal to enter the Grounds through Memorial Arch because of its inscription "Enter by this Gateway and seek the Way of Honor, the Light of Truth, the Will to Work for Men." It was not until 1970 that women were allowed to matriculate as undergraduates at the University.